Every time I take a stroll through some posh metropolitan area, replete with their trendy little boutiques and art galleries, (It's a hobby of mine, get over it.) 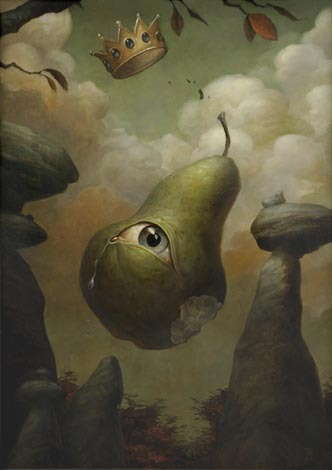 I'm continually amazed by the sheer amount art with fruit as the main subject, and even more amazed at how a majority of that art is about pears. Sculptures, paintings, drawings, fountains, prints, of every imaginable size, color and style all gaudily displayed with a majesty quite unfitting for... fruit. I mean seriously, I love a good piece of fruit as much as the next guy and yes, I'll admit that even I, once in a great while, have made the exclaimation, "Damn, that was a good pear apple tangerine guava etc." but I've never really found it to be so amazing that I needed to imortalize it in paint. So here it is, my answer to fruit portrayed in art. The king is dead people! Throw it in the bin, chuck it to the side of the road, put it into a smoothie or a nice pie or bread but for god's sake quit painting the stuff! Of course I'm completely discounting the fact that to fully illustrate my ire towards fruit portrayed in art I had to portray fruit in art... Ah the irony.